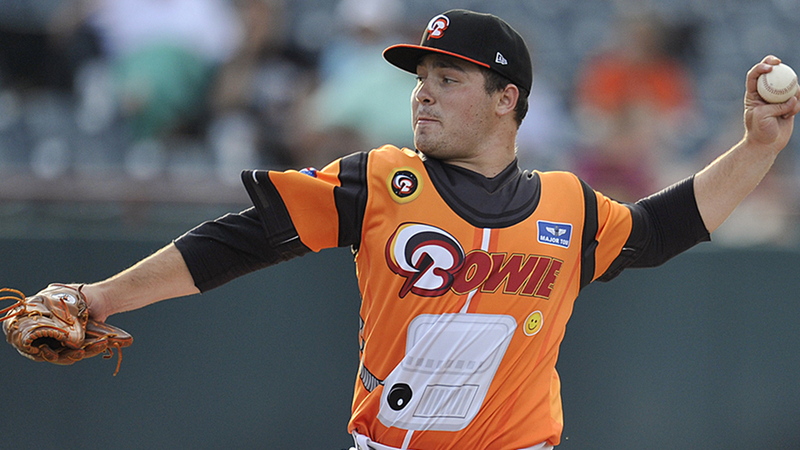 Keegan Akin has been solid all season for the Double-A Bowie Baysox, standing atop the Eastern League leaderboard in several key categories while earning All-Star honors last month. On Monday, the left-hander added his first 2018 Pitcher of the Week award to his accomplishments. The Orioles' 12th-ranked prospect posted a 2-0 record last week, allowing two earned runs over 12 1/3 innings en route to his third career Pitcher of the Week honor. He yielded eight hits and two walks while striking out 13 along the way. "It's exciting, obviously an honor," the 23-year-old said. "But, then again, it's only one week out of the year. You kind of get excited about it a little bit and then you put it behind you and move on." Akin (14-6) leads the circuit in wins, strikeouts (135) and ERA (2.77). His 1.18 WHIP ranks fourth and .209 opponents' batting average is second. "You always want to have a good year, but that doesn't mean you're going into the year thinking, 'Oh, I'm going to lead the league in strikeouts,'" he said. "You want to set goals for yourself. It's cool to be on top, but you got to go out there and not think about that stuff and just pitch and do your thing." Facing Richmond at home on Sunday, the West Michigan University product allowed two runs over 5 2/3 frames with seven strikeouts. On Sunday, he blanked Erie on the road over 6 2/3 innings, surrendering four hits and striking out six without issuing a free pass. The left-hander tossed 68 of his 92 pitches for strikes in that start. "I just think I had a little bit better command of my fastball," he said. "It makes a little bit of a difference, obviously, when you have your best pitch and can put it where you want to. Usually, good things will happen." In four August outings, Akin is 4-0 with 2.49 ERA and 28 punchouts in 25 1/3 innings. As the season winds down, his goals include staying healthy and improving his offspeed pitches. The 2016 second-round Draft selection won Pitcher of the Week twice last season with Class A Advanced Frederick in the Carolina League. Phillies No. 3 prospect Adonis Medina won Florida State League Pitcher of the Week after his 12-strikeout outing for Clearwater against Bradenton. MLB.com's No. 71 overall prospect tied his career high with the performance. J.B. Bukauskas, Houston's eighth-ranked prospect, delivered seven shutout innings against Winston-Salem in his third start for Class A Advanced Buies Creek to capture Carolina League honors.